Tekmap Consulting is pleased to announce that it now offers two additional services, Tidal Data Mapping and Geospatial Web Mapping. These two services were recently combined in a multi-year project to provide an online interactive Web mapping application for the Nova Scotia tidal energy sector. 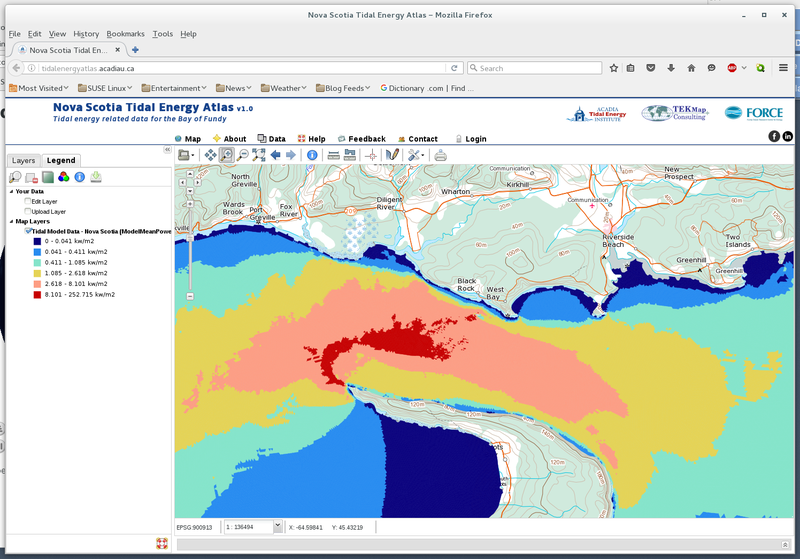 Tekmap Consulting developed a number of custom tools for mapping, processing, and visualizing in-stream tidal model data. These tools are built on the open source PySeidon package for FVCOM model data. Please visit Services for a detailed description of our Tidal Data Mapping service. Data server setup, maintenance, and administration. Please visit Services for a detailed description of our Geospatial Web Mapping service.